Pakistan has previously spent 215 months as World Champions of Squash. This is not just a record, It’s a Legacy. 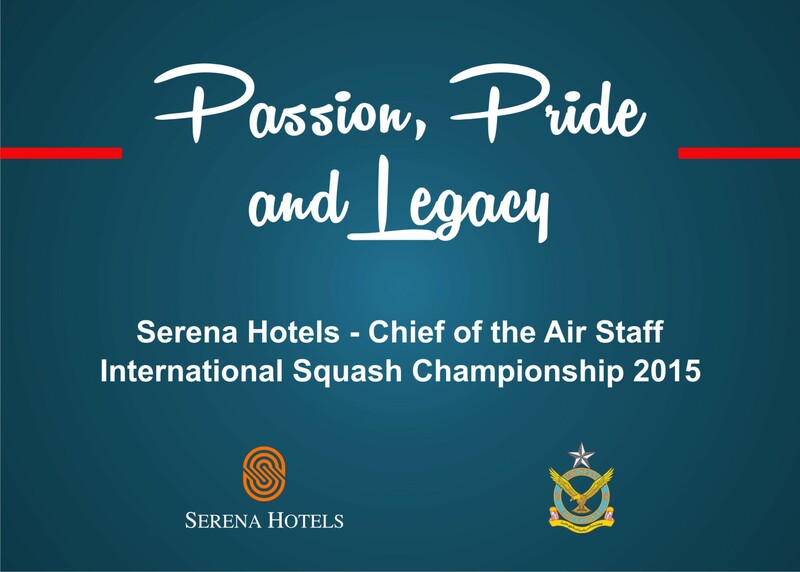 Serena Hotels in collaboration with the Pakistan Squash Federation is all set to host the Serena Hotels – Chief of the Air Staff Squash Championship 2015 at Mushaf Complex, Islamabad from 30 September to 06 October 2015. The Championship will have a prize purse of US$ 25,000 and will be hosted under the patronage of the Pakistan Air Force. Mr. Aziz Boolani, CEO of Serena Hotels called on the Chief of the Air Staff, Air Chief Marshall and President of the Pakistan Squash Federation, Sohail Aman at the Air Headquarters. The Chief of the Air Staff congratulated Mr. Boolani on the award of the Sitara-e-Imtiaz by the Government of Pakistan. Squash is widely recognized as Pakistan’s lost legacy. Last year’s much publicized Squash Championship, also cosponsored by Serena Hotels, was historic as it was the first time in seven years that renowned international players visited Pakistan to compete in a tournament. Omar Abdel Meguid of Egypt won the Championship trophy in a riveting final match against Pakistan’s Aamir Atlas. Meguid will be back this year to defend his title. The Serena Hotels Sports Diplomacy Initiative is working actively to encourage and promote healthy activities through interaction amongst various segments of the society to enhance the social wellbeing and cultural development. Under its banner, Serena Hotels also host Polo, Cricket and Golf tournaments including the President of Pakistan’s Gold Medal Golf Championship. This entry was posted on September 28, 2015 by Serena Hotels in Uncategorized.